Cheonwangbong-class landing ship tanks are currently under construction for the Republic of Korea Navy. Image: courtesy of Republic of Korea Armed Forces. The second LST in class, Cheonjabong (687), was launched in December 2015. Image: courtesy of Republic of Korea Armed Forces. Cheonwangbong-class LST is armed by a NOBONG 40mm twin naval gun. Image: courtesy of Republic of Korea Armed Forces. Cheonwangbong-class landing ship tanks (LSTs) are the next-generation landing craft being built for the Republic of Korea Navy (ROKN). The LSTs succeed Go Jun Bong Class (LST-1) ships. Under the second phase (LST-II), Cheonwangbong (686), the first LST in Cheonwangbong-class, was built by Hanjin Heavy Industries and Construction (HHIC). It was launched in September 2013 and commissioned in November 2014. The South Korea’s Defence Acquisition Program Administration (DAPA) placed a follow-on contract with Hyundai Heavy Industries (HHI) for the construction of the second LST, Cheonjabong (687), in December 2013. The vessel was launched in December 2015 and commissioned in August 2017. The third LST in class, Yilchulbong (688), was launched by HHI in October 2016. It is scheduled to be delivered to the ROK Navy in late-2017. 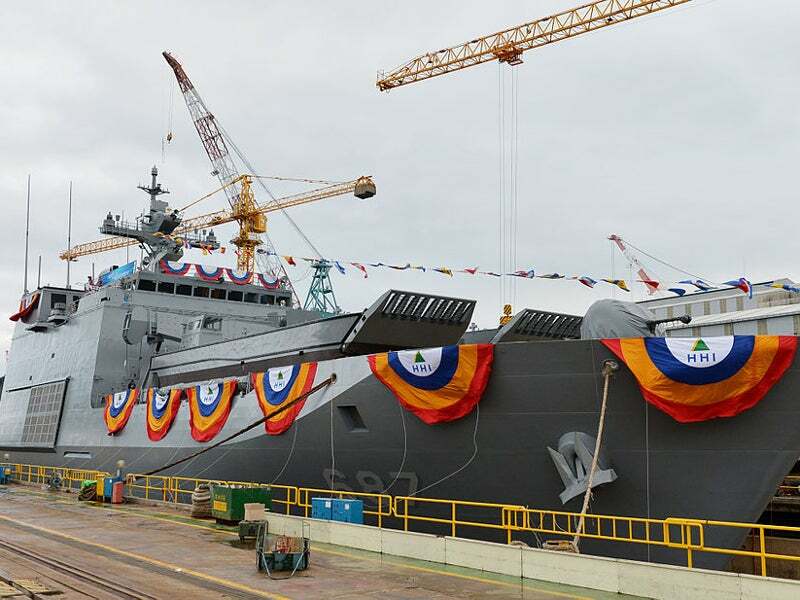 HHI was also contracted to build the fourth LST-II class ship in November 2015. The vessel will be delivered to the ROK by the end of 2018. The vessels can support a range of missions such as the transportation of troops, supplies and heavy equipment, as well as landing of military forces to remote areas that have no port infrastructure. Cheonwangbong-class LSTs are designed to cater the requirements of modern amphibious and transport missions. The vessels integrate bullet-proof facilities, fire-proof bulkhead, and stealth features for increased survivability during operations. Cheonwangbong has an overall length of 127m, a beam of 19.4m, and a draught of 5.4m. The full load displacement of the ship is 7,140t. The main gun fitted on the forward bow deck is a NOBONG 40mm twin naval gun equipped with the built-in diagnostic system. The twin gun carries 768 rounds of ready-loaded projectiles and offers a maximum rate of fire of 600 rounds a minute. "The vessels integrate bullet-proof facilities, fire-proof bulkhead, and stealth features for increased survivability during operations." The 40mm gun protects the vessel from multiple threats, including aircraft, anti-ship missiles, and hostile boats. The LST is also armed with a Korean Vertical Launcher System (KVLS) used for firing-guided missiles. The LST is equipped with state-of-the-art electronic systems such as a SPS-100K surface search radar, a SPS-540K 3D surveillance radar, and a tactical air navigation system. The countermeasures equipment aboard the ship includes a LIG Nex1 SLQ-200K Sonata electronic warfare suite and Rheinmetall multi-ammunition soft-kill system (MASS). The MASS decoy system incorporates sensors for detecting radar and laser threats. It can be easily integrated into a command and control system, or operated in standalone mode. The system offers a high level of protection against advanced sensor-guided missiles. The ship is powered by a combined diesel and diesel (CODAD) propulsion system integrating four MAN 12V28/33D STC diesel engines driving two propellers. Each engine develops a maximum power output of 5,460kW. The vessel is also equipped with four 6L21/31 auxiliary engines, which have a rated power output of 1,200kW each. The propulsion system provides a cruising speed of 18kt and a maximum speed of 23kt. The vessel can attain a maximum range of 8,000nmi.